Lawn and garden watering make up 30 to 50 percent of total household water use. Luckily, there’s an amazing landscape substance that gardeners can turn to for help: mulch. Mulch is one of the keys to growing healthy plants while conserving water. Mulch is a chemical-free protective ground covering. There are organic mulches such as straw, leaves, bark, pine needles, compost, and similar materials; and inorganic mulches such as rocks, rock chips, synthetic fabrics, and other non-plant materials. The best mulch for your yard is one created from native sources. 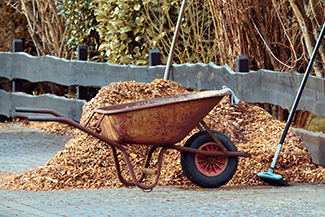 For best results, use long-lasting mulches such as wood chips, wood shavings, and evergreen needles. Applying mulch around your planted areas is crucial to a successful garden—there are so many benefits of using it! Mulch holds in soil moisture. Also, it increases your landscape’s capacity to absorb and hold water. Mulch helps to suppress weeds, and those that do break through will be easier to pull. The insulating quality of mulch helps to moderate soil temperature, keeping it cooler in the summer and warmer in the winter. By maintaining more even soil moisture and temperature, mulch promotes better root growth and plant health. Organic mulches enrich the soil as they decay, forming a rich, dark organic material called humus that provides nutrients for the soil and improves its texture. Note that inorganic mulches do not provide soil nutrients. 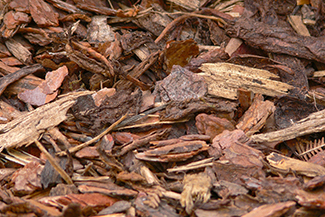 With a range of colors and textures, mulch provides aesthetic value. Water the ground thoroughly before and after applying a mulch cover. Spread a mixture of coarse and fine mulch to prevent sunlight from reaching the soil and reduce the chance of weed growth. Mulch all areas that are not covered in grass or thick ground cover. Never pile mulch against the base of plants or trees. This will help to prevent diseases and pest infestation. Instead, form mulch into a donut shape around the trunks of trees or stems of plants. Use between 2 and 4 inches of mulch for most applications. Put a 4-inch layer of mulch around your trees and shrubs and a 2-inch layer around your garden plants. Cover bare areas with 2 to 4 inches of mulch to control erosion. These should be the depths of the layers after settling. Maintain 2 to 4 inches of mulch by adding it annually as needed. There is no need to remove the old mulch before adding more. Blanket dormant perennials with several inches of shredded leaves or whole pine needles to protect them from freezing weather. Spread mulches under annuals after they are well established. When converting grassy areas to mulch, smother the grass with a thick layer of cardboard or newspaper rather than using chemicals. Some hardy grasses must be rooted out for successful removal. Do not put organic mulch where water flows rapidly or it may wash out. Rocks and other heavy, inert materials can be used in berms or buffers to slow the flow of water entering mulched areas, protecting them from wash-out. Create a self-mulching lawn! Wait to mow until your grass is between 2 and 4 inches high. Then mow off only the top one-third of the grass, and don’t bag the clippings. This way, the clippings will feed your soil and won’t smother your grass. If you have too many clippings, rake them into mulch layers around trees and shrubbery. 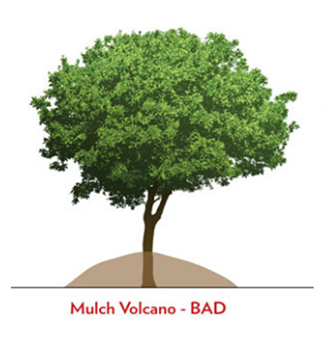 Mulch helps trees conserve water and survive drought conditions. 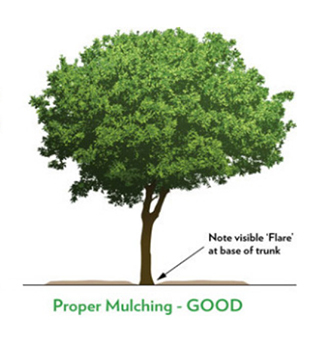 Use the following tips to mulch your trees properly. Distribute the mulch evenly around the root zone of the tree and extend it out to the drip line. The drip line is located directly below where the canopy of the tree reaches its farthest point. Layer mulch around trees. Mulch should only be four inches deep after settling. Too much mulch can reduce the amount of water in the soil and encourage fungi and bacterial growth. Use long-lasting mulches made of loose, fibrous material. Bark and wood chips are commonly used around trees. Stay away from white, black, or plastic mulches. When watering trees, target the water underneath the mulch layer.